Perfect for a SUPER SIZED birthday celebration! Our vanilla fortune cookie is baked to order and hand dipped in your choice of caramel, dark, milk or white chocolate. 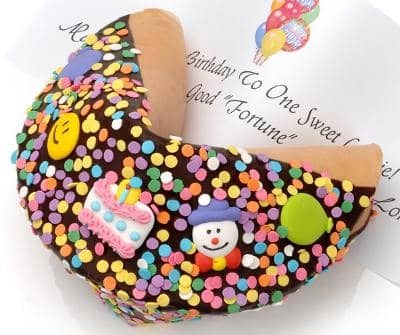 Send them Happy Birthday wishes and some good fortune too with our Birthday Giant Gourmet Fortune Cookie. It's the perfect birthday gift and greeting all in one! Our Confectionery Artisans start with our hand crafted SUPER SIZED vanilla fortune cookie baked to order and hand dip in your choice of caramel, dark, milk or white chocolate. Each Cookie is finished with festive confetti sprinkles and birthday themed icing decor hand crafted by our confectionary artists for the perfect treat! Your finished treat is then wrapped in a cello bag and finished with a lush satin bow. Our cookies are gift boxed with tissue paper and hand packed in our Glossy White Gift Boxes. Each Super Giant Fortune Cookie spans 10" - 10.5" with a diameter of 17.25" and a whopping height of 7", this super sized treat weighs 1.3 - 1.75 lbs. Your personalized message goes on the 14" long fortune inside each cookie for an unforgettable and unique gift.